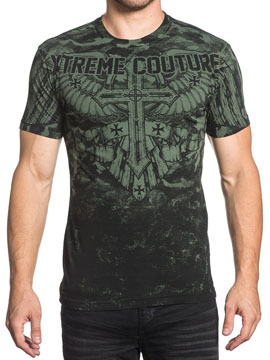 Xtreme Couture Lost Soldier mens short sleeve crew neck t-shirt features Xtreme Couture logo, cross, eagle feather angel wings accented with camouflage pattern printed across the shoulders. The back features Xtreme Couture logo, cross, eagle feather angel wings accented with camo pattern printed across shoulders and center. 100% cotton, light weight, slim fit. Color: military green.